Yes, that's the way I do it too. 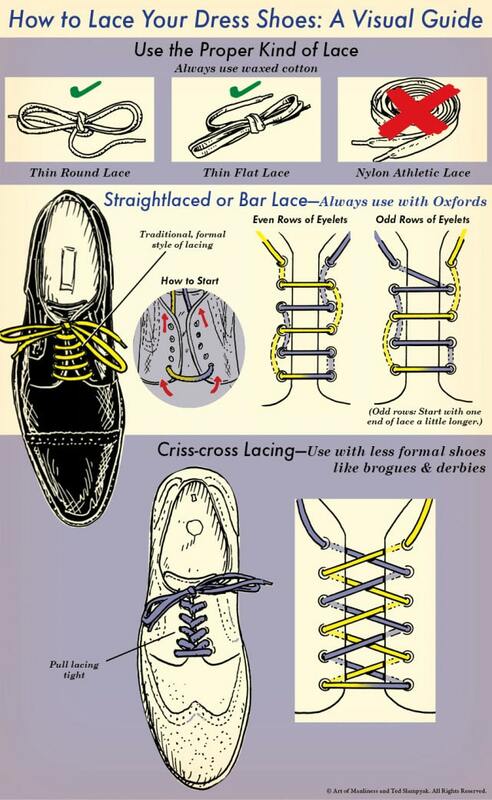 Doesn't work with odd numbered eyelet shoes; you end up with both laces on the same side. It works ok on the five eyed plimsoles that I am looking at right now. Ok Bill, I have been trying recreate your problem with the laces and I think I might have worked it out???????? Thank goodness I have nothing better to do!! So, when you have threaded the the bottom brace of holes from the outside inwards-----both lace ends are now on the inside of the shoe----- take one of the laces and thread it from the inside to outwards through the OPPOSITE TOP hole and thread the other lace round and round working towards the top as Tobus describes. That should work. Last edited by Jock Scot; 21st February 19 at 08:09 AM. Then take the long lace and cross it over to the other side. Voila! And that, gentlemen, is what I did just now, and you are correct: it works. I still don't like that crossover underneath, but it doesn't much show. Thanks for your correct advice. I had to go look at my shoes, at least half have 5 eyelets. I lace just as that excellent WB page Tobus found does (use the same method on all my boots). I used to take one lace straight to the top but changed around 15 years ago as I thought that it didn't spread the tension evenly when pulling the laces tight - I hate loose shoes and always apply a double knot to reduce chances of them undoing, so maybe its just my overly enthusiastic lacing that produces the strain. I have to agree that cap-toed shoes are appropriate for nearly any occasion. I wear them frequently with kilt or trousers. In fact, I'll be wearing black cap toes with my kilt today for the first fitting on my new kilt jacket at Yuen Tailors. I think black, brown, tan is a matter of personal taste and how it works with the rest of the outfit. I've seen tan shoes look surprisingly sharp with a blue suit, for instance. So experiment and see what works for you. This is how I straight lace my shoes. There are two ways for odd or even numbers of eyelets. I think its important to remember that you're not wearing a uniform therefore it is up to you what you wear and how you wear it. That said there are conventions, some stronger than others, and you probably want to avoid looking as if you are breaking convention out of ignorance rather than choice. The convention for kilted footwear is brogues. Buckle, ghille or plain. Black is most common but brown is not unusual. Just as convention would suggest you should wear black shoes with a dark suit but some people choose to wear brown shoes. I often wear boots with kilts. Either walking boots or I have a pair of brown brogue boots which I sometimes top off with puttees. Not very conventional but I doubt if anyone thinks I'm doing it out of ignorance - just a lack of style if they don't like it. Personally I would not wear plain or toe capped shoes without brogued punch holes but I wouldn't point fingers at anyone who does. I note Jocks remark about the lacing, I suspect, like me, he laces them as per Arnot's Photo, with the laces straight across. Oh, I tend to wear plain black Oxfords..
Just curious about this but with regards to the combat high as oppsed to brogues where does the speed lacing system fit in with that? Never got issued with high leg combat boots, it was Boots DMS (direct moulded sole) when I was in the RAF, They go only slightly above ankle level. In their case they were laced the same way with the visible layer of laces going straight across so they could easily be cut off.